Not only is Catherine up on what’s happening around town and willing to re-visit places she’s experienced hundreds of times, she is also prepared for almost any minor emergency that should occur. 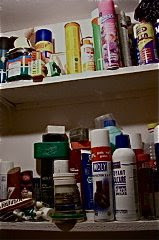 That’s why I marvel over the cabinet of products in her WC. It’s a collection of sorts. I love the preparedness it represents, with its assortment of air fresheners, surface cleaners and laundry detergents -- a quest for clean in many scents and colored containers. Step in gum? Catherine most certainly has a product to remove it. Break the handle of a mug you bought as a gift? Oh she has a super-strong glue to repair the disaster. Need to polish your shoes? She’s got several colors to choose from. Spill red wine on a pair of khaki paints? The solution to your problem is just meters away.